DETROIT — The idea was to get two new transmissions for the price of one. In today's world, cost savings trump even the fiercest rivalry, especially with stricter government-imposed fuel economy standards looming. Ford Motor Co. agreed to develop a 10-speed gearbox for rear-wheel-drive vehicles such as the F-150 and Mustang and let General Motors use it, too. And GM, in turn, would share with Ford a nine-speed designed to make its front-wheel-drive crossovers and cars smoother and more efficient. But Ford didn't get quite the result it anticipated from the arrangement, signed five years ago this month. 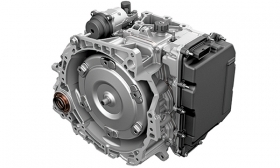 It has elected not to use GM's nine-speed transmission out of the box, opting instead for a series of new eight-speed transmissions on vehicles such as the Ford Edge, Ford Transit Connect and Lincoln Nautilus. The first of those is based off the nine-speed, dropping one of the gears. The second eight-speed, for higher-performance vehicles such as the upcoming Edge ST and V-6 version of the Nautilus, adapts a six-speed that was co-developed with GM as part of a 2002 tie-up. A third eight-speed is expected for smaller, lower-torque vehicles. GM's nine-speed didn't provide enough of a fuel economy improvement to justify the added cost and weight of an extra gear, Ford said. "Typically, if anyone gave me a transmission that didn't require much work, outside of tuning it for a specific vehicle, I would take it and run," Dave Sullivan, analyst with AutoPacific Inc., told Automotive News. "It's a lot of design work after the fact to come up with their own flavor. It shows there might be some different schools of thought in terms of transmission efficiency." GM, meanwhile, has said the nine-speed adds refinement, giving its vehicles a more premium feel. It has launched the nine-speed and 10-speed transmissions on a number of vehicles. The shift underscores the different strategies the nation's two largest automakers are taking with their powertrain development, even amid their collaboration. GM began rolling out the nine-speed gearbox in 2016, but fuel economy gains were minimal or nonexistent. The 2017 Chevrolet Malibu, for example, delivered just 1 mpg more in highway driving than the previous generation with an eight-speed transmission — up to 33 mpg from 32 mpg. The China-built Buick Envision, which switched to the nine-speed from a six-speed for the 2019 model year, achieves 1 mpg less on the highway — 25 mpg, down from 26 mpg, according to EPA estimates. "I don't know if it necessarily delivers for all applications," Sullivan said. GM, though, contends that the nine-speed offers a better driving experience than the eight-speed it replaced. "We've engineered our nine-speeds for even more refined shifts," GM spokesman Tom Read said in a statement. "Smaller steps between gears in a nine vs. an eight-speed enable smoother shifts for customers." The automaker said the new transmission has a wider gear ratio than the old eight-speed, providing benefits in off-the-line acceleration and highway cruising. "The smaller steps between the gears, compared to the eight-speed, enable smooth, almost imperceptible upshifts for excellent refinement," Dan Nicholson, GM's vice president for global propulsion systems, said when the 2017 Malibu was introduced. "No matter the engine torque or vehicle speed, the 9T50 is always in the perfect gear." Ford made the decision to switch from the nine-speed to an eight-speed before GM began using it on any production vehicles, according to a source with knowledge of the automaker's product planning. Ford hasn't revealed fuel economy figures for the first vehicles with the new eight-speed gearboxes, but its engineers believe they can achieve everything GM is getting out of its nine-speed with one less gear. "The small efficiency benefit did not justify the added weight and cost of an extra clutch and gear," Ford spokesman Mike Levine said in a statement to Automotive News. Ford has made vehicle lightweighting a top priority since it redesigned the F-150 with an aluminum body for the 2015 model year. Although transmissions have long development cycles and the eight-speeds were in the works well before Jim Hackett took over as CEO last year, the decision to take a different, more efficient route mirrors his mandates to cut costs and focus on "operational fitness." In October, Hackett called for a $14 billion reduction in costs through 2022, with plans to cut $10 billion in incremental material outlays and reduce engineering costs by $4 billion over the next five years. But the transmission switch also is about performance, at a time when Ford is creating a broad portfolio of sportier and high-horsepower vehicles. By adapting the six-speed from the 2002 GM alliance, Ford hopes to get more torque and power. The Nautilus, when equipped with a 2.7-liter V-6 engine, will get 335 hp, Ford said, while the Edge ST, which gets a specially tuned 2.7-liter V-6, will generate 335 hp and 380 pound-feet of torque. The higher-volume eight-speed gearbox, based off GM's nine-speed, will power the mainstream Edge, Nautilus and Transit Connect. The 2019 Transit Connect, which goes on sale this fall, will come standard with a 2.0-liter, four-cylinder gasoline engine mated to the eight-speed transmission. A 1.5-liter diesel, also paired with the eight-speed gearbox, is optional and is expected to get 30 mpg highway, Ford said.